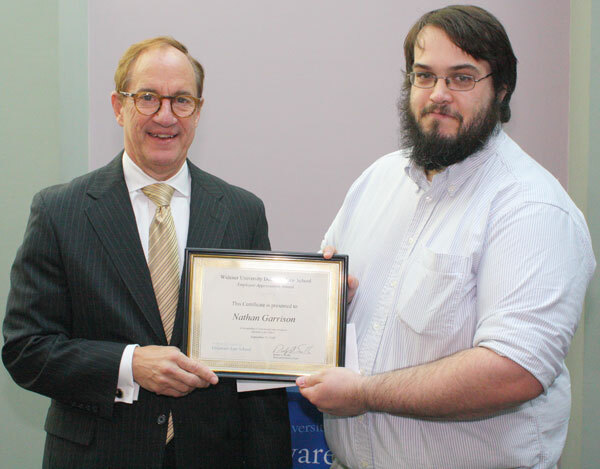 Congratulations to Nathan Garrison, the recipient of the Employee Appreciation Award for the fall 2015 semester. Nathan receives this award in recognition of his leadership, organizational, and team building skills as our webmaster during our transition to the Delaware Law School. He stepped up as a leader throughout the web site redesign and thoughtfully presented feedback, ideas and technical suggestions for accomplishing our goals. With Nathan’s help we have a beautiful new website that will be instrumental in our recruiting efforts. He has also done an outstanding job helping all of us “navigate the waters” so that our new, digital identity, our “face to the world” as Delaware Law School, is functioning properly. Nathan is a true team player and a crucial member of every individual office on campus and many committees and groups which include the web advisory group, brand ambassadors, web editorial content sub group, and social media content subgroup. He is our “go to” person for all things involving the web site and is a proven law school community leader. Picture: Dean Rodney Smolla presents the Employee Appreciation Award to Nathan Garrison.